On Needles Into The Ground Khost those current masters of monolithic, atmospheric industrial doom are "deconstructed and reconstructed by" Justin K Broadrick. It's billed as Godflesh but it could have easily just have said Justin K Broadrick. Expectations of something along the lines of A World Lit Only By Fire, Godflesh's first album since resurfacing are quickly dispelled; as these hard-hitting remixes draw upon Broadrick's harsher and more experimental tendencies. Subject to Justin K Broadrick's treatments and manipulations, the material from Khost's second album Corrosive Shroud, is given a radical overhaul creating something more rhythmic and directly oppressive. In our review of Corrosive Shroud the album that provides the source material for Needles Into The Ground we commented upon how Khost drove "their hypnotic monolithic grind further into multi-layered and noise drenched areas" but that's nothing when compared to what Justin K Broadrick's does to Khost on Needles Into The Ground. At the hands of Justin K Broadrick it just gets heavier and heavier. Opening with the icy drone electronics and sampled voice of Oxbow's Eugene S Robinson, Justin K Broadrick propels 'Inversion' into a brutal slab of rhythmic noise; sure the constituent parts are there: the layers of low end bass, the deep growling voice but the Khost sound is so transformed rendered as a heavy throb of distortion cut with searing and soaring guitar anchored around the brutal, incessant noise lashings as it surges onwards almost collapsing in on itself under the weight of its relentless approach. Even at their most direct Khost were never this brutal, this aggressive. By not permitting any light to seep into the monstrous roar of 'Shadow on the Wound', Broadrick almost stays firm to the Khost original. Lumbering bass distortion and Godflesh styled drum loops are entwined with Khost's disorientating floor scraping vocal shreds and atmospheric chants. But they're drenched in distortion dredged with stuttered throbbing keys, dragged deeper into low end machinations and reverbed guitar scrapings. Shrouded in claustrophobic layering they almost mask the Khost sound, as it wrestles with mammoth explosive shudders and distended textures of Khost's distinctive atmo-wails. Broadrick was at one point years back a go-to-guy for remixing but Needles Into The Ground proves he has an affinity for the music, as well as the personalities behind Khost and it shows. By darkening the black atmospheres and intensifying the rhythmic possibilities it appears he has been given free rein to mould the Khost sound into something more brutally oppressive, which given the source material is really saying something. Broadrick is in full-on electronic noise mode for the final track, throwing away the atmospheric blackened grind of 'Revelations Vultures Jackals Wolves' for a heavily cut-up and spliced track of gritty textures infused with feedback injections. Khost's original is literally obliterated in a track that leans heavily on crushing electronic noise - calling to mind the dirty textures of Sutcliffe Jugend - and the rhythmic noise that fuelled JK Flesh's solo album Posthuman. It is so heavily cut-up and processed you'd be hard pressed to discern any elements of the original track and that's before the whole thing is sucked up into a vortex of whirlwind noise. To paraphrase Godflesh this one is merciless. On 'Deathsset', Khost's sole contribution to Needles Into The Ground, they strip back the layers eschewing the atmospherics touches, ethnic samples and even the doom chords which make their albums so unrelenting for a starker grinding onslaught anchored around propulsive drum rhythms and Damian Bennett's bass laden tones. It's almost a conciliatory nod to the early Godflesh sound unearthing the duo's shared industrial roots with Justin K Broadrick. Only the guttural vocal scrapes and passages of blackened guitar squall supplied by Andy Swan are evidence of the Khost sound exemplified on Copper Lock Hell and Corrosive Shroud. 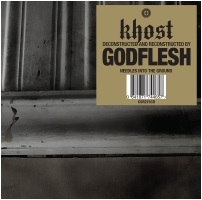 Godflesh's reappearance with A World Lit Only By Fire saw them return to their industrial noise-rock roots but these interpretations of Khost are so inventive, so dynamic filled with rhythm and distortion, they owe as much to JK Flesh's solo album as well as the experimental treatments and electronic noise found within Justin K Broadrick's extra-curricular activities as much as they do to Godflesh. Khost won't mind though, as between them the Khost members Andy Swan and Damian Bennett have been part of the Justin K Broadrick projects Final, Techno Animal, 16-17. It's worth noting that Daniel Buess, the drummer and experimental musician behind the rhythms and drum loops here, passed away not long after after recording his input to Needles Into The Ground.